Lookie .... photos from 2017 ... and I edited mine before Scott could do his (so there's more to come). This was my first time really far off the road system in Alaska. We flew to King Salmon and then took a puddle jumper over to Brooks Camp. You land on the beach and head straight to the ranger station for bear school. After being deemed bear aware, you are set lose in this ecosystem where bear and human coexist. But never to fear there was ample staff all around - we've never seen so many rangers before and for good reason too! The campground is surrounded by an electric fence roughly a quarter mile from the ranger station. As we approached the camp with its electric fence, fire pits smoking, and trail crew chopping wood, I felt like we survivors in a zombie apocalypse searching for shelter. After setting up camp, we headed out to see bears. June is a less busy month at Katmai - the salmon are just starting to come in and the bears are just arriving. We had been following reports of what bears were starting to show up at Brooks Falls so we knew there were some in the area. Our first day we had the platform almost to ourselves for hours with just a few common mergansers out fishing. Scott and I spent the time getting used to the telephoto lenses we rented - a Canon 100-400mm f/4.5-5.6 and a Tamron 150-600mm f/5-.6.3 (PS we ended up buying the Tamron - the Canon is a beautiful lens but the Tamron gives us bigger range). We also found that 400mm was enough zoom for the platform at Brooks Falls - but we figured we'd like the extra zoom for other adventures. The platform also had new rules this year - no tripods, only monopods allowed. I decided to hand hold my lens and Scott bought a monopod for the trip. Our first bear had two yearling twins. She had very pretty light brown ears. We spent hours watching her fish and chase after her rowdy twins - completely worth hanging out at the platform for hours. Second day started out a little rainy. We decided to head up Dumpling Mountain to take in an aerial view of Brooks Camp. Then it was back to the platform for more bear viewing, which included a bear fight between our light eared momma bear and a big grizzled male. Momma stood her ground and chased off the male. Our third day was a trip out to the Valley of Ten Thousand Smokes. Originally, Katmai National Park had been set aside for this valley to be the star attraction. Over a hundred years ago, the valley was filled with hundreds of feet of ash from the Novarupta volcano (the largest eruption in the 20th century). The ash covered the rivers, which were super heated from the volcanic activity. This created a valley full of steam fumaroles. The original geologists who came to study the area thought it would be the next Yellowstone. However after a few years, the steam fizzled out. You can still visit to see the amazing pyroclastic flow covering the valley flow and the rivers that have slowly cut their way through. We're definitely coming back to backpack out into the valley. We then were back on the platform at Brooks Falls where we finally saw a bear successfully catch a fish! And we also got to see a stand off between five bears. The platform was noticeably busier now that the weekend had arrived but we still had plenty of room. We also got to experience a bear jam at the lower river bridge. When bears approach the bridge within 50 yards the bridge gets closed. This means that you may not be able to get to the Brooks falls platform or get back to the lodge/camp. We were stopped by one of the Rangers and pushed back several times as we waited for a bear to clear the area. Our last day at Brooks Camp we headed to the platform early in the morning. The morning light was quite harsh and shooting wasn't great. The rangers seemed to be practicing for crowd control for the coming July when the platform is limited to 40 people and everyone gets a one hour viewing time before they get pulled off and have to put their name on the list to get back in again. There were certainly less than 40 people on the platform so it wasn't a big deal for us. We had to eat at least once at the lodge - famous for its buffets. It was pretty decent and well priced considering everything has to be flown out. We then joined a ranger for a walk through Native Alaskan archaeological sites. Then it was back onto the float plane to head back to the big city and plan our next adventure. Definitely want to backpack Valley of Ten Thousand Smokes, backpack and pack raft Aniakchak, and come back in the fall to Brooks Camp to see the colors! Coming in June was great - even though there weren't as many bears it was worth it to have space on the platform (though I did get my space stolen once when I stepped back for a few second to switch out a lens - by an off duty interpretive ranger of all people - he ended up being cool). 1. Watching the bears interact with each other. Who has dominance? Who decides to leave and who decides to fight? Different fishing strategies - snorkeling, belly flopping, snatching fish out of the falls. 2. Baby bears. We saw two sets of twins and one set of triplets. Didn't get great photos of the triplets - we learned that she was a first time momma and very protective of her cubs - most of the time they were up a tree. 3. Meeting the "old timers" at the camp ground. One guy has been coming two to three times a year since the 1950s. We also met Mo Gillian who studies bear behavior on her "free time" - she had decades of research on the Katmai bears as well as polar bears up north. 3. Making friends with the rangers. We always seemed to run into the same ones. We decided it was because they figured we were trouble and were keeping tabs on us. 4. Hanging out with our companions - Morgan and Dani! Thanks for coming with us! Dumpling Mountain hike. We were very disappointed to not find dumplings on this trail. Momma employing her belly flop technique - she was my favorite bear to watch. One of my favorite trips in Alaska. We ventured east to Wrangell-St. Elias National Park for a five day backpacking trip across glaciers. This was my longest and heaviest trek yet and our first time out on a glacier. We decided to go with an outfitter for this trip since we weren't familiar with the terrain and had no glacier skills. Starting from the old copper mining town of Kennecott we hiked several glaciers and learned how to work with crampons. Trusting that those spikes would hold me and my pack down an icy slope took a lot of mental coaching. We managed to do what was normally a two day hike in one day. So we were able to spend two nights at one site, take a "rest day" to do a crazy hike out to see Goat Hair glacier. We could hear it calving but wasn't able to see any of the ice fall. Scott and I then broke off from the group to explore some of grassy hills and I ended up getting attacked by a nesting ptarmigan. 1. Watching Scott jump into a glacial water pool. The weather was so awesome that the guys went for a dip in a pool on the glacier. 2. Sitting up on the moraine after dinner and listening to the glacier move slowly below. 3. Learning new trail recipes from our guide Ethan as well as glacier crossing skills and route finding. Oh yeah ... and learning about cool gear to add to our arsenal - always dangerous. 5. Being reminded of the vastness of this universe and how small we are in it. 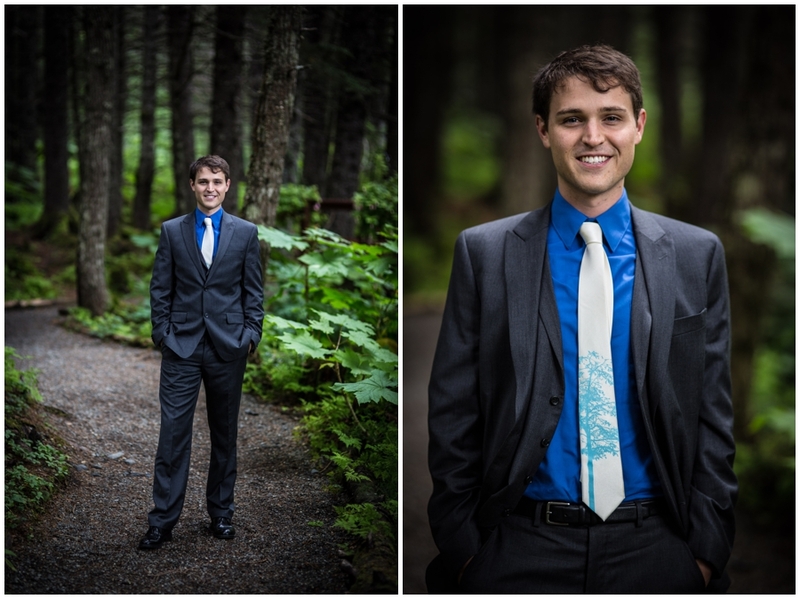 Because the Alaska summer is too short to be shooting weddings every weekend, Bear and Penguin Photography has slowly retired out of wedding photography. Instead, we get to have adventures of our own in our beautiful home and share them with all of you (when we remember to post.) Scott is currently in Japan so I'm trying to take advantage of absolute control over the laptop to get some photos edited and blogs posted...because I'm apparently terrible ... terribly busy enjoying other things not involving photo editing. How embarrassing ... these photos are from September 2016 when Scott's bro David and his amazing wife Nicole came up to AK for some backpacking. We hit up Lost Lake in the Chugach National Forest. As is *almost* always the case with Scott, we had beautiful weather. Looking back on it, the entirety of summer 2016 was gorgeous - this year, not as much. Also on our trip were Cascade and Nikki, our diehard canine hiking companions. We started from the Lost Lake Trail Road trailhead about 7 miles to the lakes. Lost Lake can also be a through hike of ~15 miles and some people do this as a trail race all the way through. With a blue bird sky, Resurrection Bay was gleaming behind us and we kept having to turn around to take in the sweeping views - almost makes you want to walk backwards but with a 40-50 lb pack and trail to follow this is generally not recommended. One of the cool things about backpacking in early fall is the ability to catch the Northern Lights if the conditions are right. We had looked up the Kp level prior to leaving and knew we had a chance of seeing something. So Scott and I set our alarm for around 2 or 3 am. We peered out of our tent in time to see the aurora borealis sweeping across the sky and reflecting off the lake. One of the bad things about taking this long to *ahem* edit and blog photos is that the memory starts to fade. I just remembered why I don't have any photos after our first day. Unfortunately, my camera decided to freak out and my spin dials completely stopped communicating with my camera. So there weren't too many aurora shots that I could salvage in the end. Super happy that there were at least a few that I could save! I have a vague memory of either having to guess on my settings or being stuck in one setting but can't remember exactly what was wrong with my camera ... though I'm fairly certain my camera started working again when I got home. This was also a trip where Scott didn't carry his DSLR with him .... which reminds me of why we always bring at least three camera bodies with us to every wedding we shoot!! Jennifer and Charles were married in a short and sweet ceremony at the Fox Hollow Chalet in Anchorage. The skies were gray and threatened to rain. From behind the camera, the sky seemed washed out and uninteresting. I was a little disappointed that we didn't have a magnificent blue ceiling and powdery clouds. However, the camera seemed to pull out a bit of drama that contrasted against the greenery and the brilliant fireweed. As always, we loved hearing the speeches and reading the guest book, which was cleverly done as a Jenga set. Though it was a short day for us, we managed to capture some beautiful moments. Cindy and Joe had a beautiful ceremony and reception at the Dena'aina Center in downtown Anchorage. I love how the clean architectural lines of this building and the surrounding area highlight this gorgeous couple. I also loved the combination of the traditional dress of both of their mothers, the respectful bows of the couple to their parents, with the Western styling of the ceremony - a wonderful blend of cultures and traditions. Absolutely loved working with this couple and honored to have shared in the fun! Tatiana was a bubbly bride with Jeff serving as her anchor. Tatiana's dress was incredibly unique and had the all important twirl factor (plus pockets!) I had a hard time choosing these photos and many of them made me laugh thinking back to this day. This couple had such fun personalities, which made them easy to work with, and reflected in their wedding. And yes - those are hand painted silk ties on the boys (painted by the bride herself). Another thing I enjoy about many of these photos is seeing the expressions of people in the background reacting to the happiness of the couple. We did a first look with this couple. Maybe 10-15% of our clients choose to see each other before the ceremony. The plus side is that it allows you to get a lot of your formal photos out of the way, makeup and clothing are fresh, and people usually aren't hot, hungry, and tired yet. We still captured a great reaction from Jeff as he watched Tatiana walk down the aisle, even though he had seen her moments earlier.